Last summer as I was picking someone up at the Austin airport, I heard a woman who was talking on her cell phone describe Austin as "sort of a tropical paradise." This year Austin is no tropical paradise. It's dry as a bone. There are usually heavy rains in May or June that carry us through the summer. By the end of June temperatures are settled into the 90's and they get up around 100 by about mid-August. What happened this year is that we carried a rain deficit over from last year and it got worse during the spring. There were barely any heavy rains in May and June and by early July temperatures were hitting 100. Since then here at my rent house we've had maybe an inch of rain and temperatures have hit 100 almost every day. Out at my land it's about the same except there's been a little less rain out there. Hot dry summers are the norm here, but this one is hotter and dryer than most. 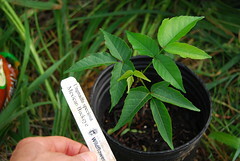 Last spring I planted a peach tree, a tulip tree, a sycamore, a red oak, a Mexican buckeye and two live oaks. The tulip tree and the sycamore were in the lower meadow. I watered them sporadically and they were doing fine just after Kerrville. But the heat and the dry started taking their toll last month and It was really hard to schlep water down to them, so I triaged them out and they died. The Mexican buckeye went next. I'd planted it where it got too much sun. If I had watered it every day, it might have made it, but that was too much to do for just one tree off alone at the end of a trail, so it got triaged out as well. The peach tree is hard to get to, so I just look at it from afar, but it seems to be doing fine. The red oak started showing signs of the strain, so I put some shade cloth over it and I'm watering it every time I go out to the land. The live oaks are happy as can be. I alternate watering them, one gets watered each time I go out there, and that seems to be good enough for them. These are the conditions that can lead to the most devastating kind of wildfire, especially in places that have, until recently, been fairly lush. I don't know what you can do to protect against that. Some ideas: Make sure that any place anyone might park or idle a car is mowed short and often bec. 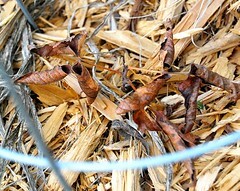 catalytic converters can ignite dry grass. Clear brush (aka fuel) for a ways around the buildings, like a firebreak. Make it easy for firefighters to access the river. Maybe call them and ask for advice about posting signs and making sure they can get there if they have to. Maybe get an apartment building with a NYC water tower on it, move it to the land, and keep it filled. Or just get the water tower. Tell your yard hippie that if there is a fire he should get out fast because it can jump around and trap people faster than anyone could imagine. And make sure the insurance is paid up.